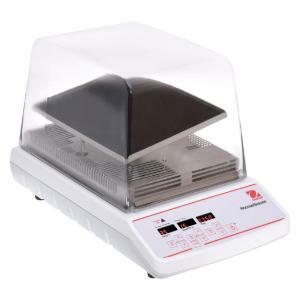 Save Incubator Space with Benchtop Incubating Rocking Shakers. The OHAUS Incubating Rocking Shaker combines smooth rocking motion and general purpose incubation in one compact bench top unit. Operating Features: Microprocessor Control-The microprocessor control provides electronic tilt angle adjustment which allows user to easily adjust rocking angle from 0 to 15 °C while unit is operating. Precise speed control provides smooth, low-speed rocking motion down to 1 rpm. PID Temperature Controller-Maintains precise temperature control from ambient +5 to 65 °C. Easy-to-use controls allow users to adjust temperature in 1 °C increments. LED Display-Touch pad controls with easy-to-read, independent LED displays for temperature, speed and tilt angle, and time allow operator to view all settings at once. Provides repeatable and accurate results every time and is easily visible across lab benches. Timer will display elapsed time or, when programmed to user defined limit, will shut off unit when time reaches zero. Display will show last used settings, even after power has been turned off. Safety Features: Overload Protection-Audible and visual signals will activate when system detects an obstruction or overload of the tray. Speed Ramping Feature–Slowly increases speed to desired set-point to avoid splashing. Audible Alarm-In timed mode, alarm will sound when the time reaches zero. Caution Hot Indicator-Symbol illuminates when the temperature of the air in the chamber reaches 40 °C and remains lit until temperature cools down. Spill-Resistant Design-Channels fluids away from internal components. Polycarbonate Lid-Permits viewing of samples without disturbing internal temperature. Operating Conditions-Unit can be run in conditions from 5 to 40 °C (41 to 104 °F), maximum 80% relative humidity, non-condensing. Applications-Cell cultures, staining and distaining gels, hybridization procedures, and blotting techniques. Ordering information: Unit includes a detachable, 3-wire cord and plug.